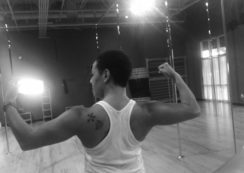 Pole fitness is for all women and all body types! If you’re new to pole, try out one of our intro classes or beginner series designed to teach you all the of the basics. If you have previous pole experience, talk to us about series placement! This is an introductory class designed to let you experience the basic mechanics of fitness pole dancing. Learn basic yet fundamental pole aspects, such as hand positioning, maneuvering around the pole, and beginner tricks and transitions. Practice your first pole moves while combining them into an effortless routine! This is a 60 min class designed to give you the best training that will improve your overall pole strength and abilities. This class focuses on resistance training, balance work such as handstands and forearm stands, suspension training, core strength, shoulder strength, and flexibility. Recommended for anyone taking pole classes. Need some extra practice or instruction? Use this time to work on your routine or difficult moves. This class is open to all levels that are currently enrolled in a series class. Improve your routine skills and pole flow confidence in these monthly choreography classes. Learn a choreographed routine to a fun song with pole floor work, spins, transitions, and flow. Instructors rotate each month so you are always getting a different vibe and style in class. Students must be enrolled in a series class to attend these classes. “Dance like no one is watching.” This unique class teaches how to take an internal emotion and transform that into a beautiful external movement. Each class includes some basic moves to incorporate into your freestyle. Heels, knee pads, pants, and leg warmers are recommended. Students must be enrolled in a series class to attend these classes. Liquid Motion® is a methodology that can apply to any aspect of life, from everyday movement to technical dance vocabulary. This program teaches how to achieve a seamless and natural movement quality by applying basic dance theory and sensual movement exploration. In your first pole series class, learn a routine that will build the foundation for all of your future pole work. Spins, floorwork, and transitions make up this six week course so you can learn the proper hand placements and techniques to move smoothly around the pole. Now that you’ve mastered basic spins, it’s time to start combining spins and learning to climb the pole! Learn how to climb to the top of the pole, and two poses on the pole while continuing to build your strength and fluidity with combo spins, floorwork, and transitions. This is a six week course. You’re a master climber now! This eight week routine has 3 different climb sequences in the routine, plus a drop, advanced spins, and a handstand. You will really feel the cardio in this routine, and love the strength you are developing! It’s time to go upside down! The next four series are each six weeks long, and start with a basic invert and advance through leg switches, superman, and butterfly to flatline. Your floorwork will reach the next level as you learn forward and backward rolls, and get ready for some dizziness as you tackle your first ride on a spin pole! We also begin prepping for shoulder mounts in these series. Are you ready for some height on your inverts? The next four series will build your aerial invert strength, as well as teach you how to do a shoulder mount. Combos start to get longer in these series, and will challenge your endurance, strength, and flexibility. You’ll realize you can now do moves you have seen many of your favorite pole stars do. These series are 6-8 weeks long. You’ve hit Legend status! New pole moves and techniques are created every day., so you can pole as Legend forever! Legends routines continue to build your skills, create new combos, and push you to your full potential. Legends routines are customized to your class needs and wants. Nothing is off limits when you reach Legend status, so reach for the stars! These series are 7-8 weeks long.